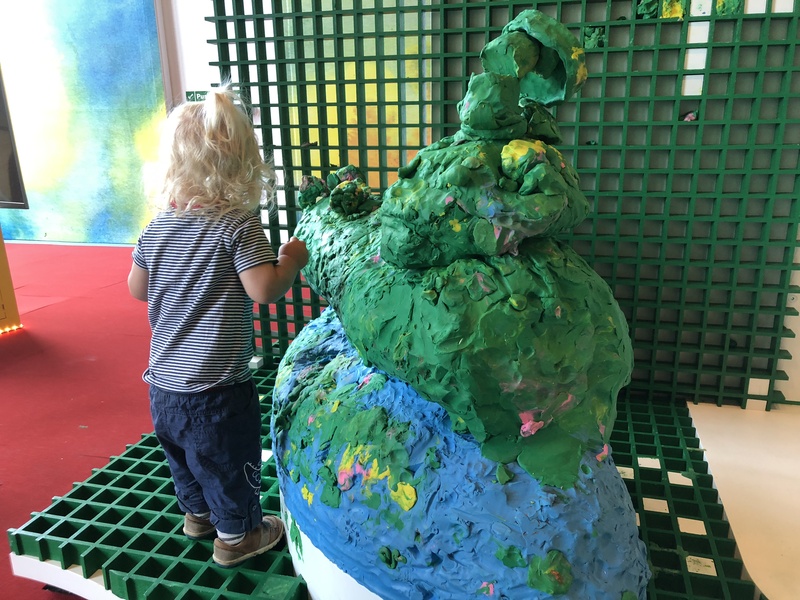 We went along to Tramway yesterday to check out their Children’s Exhibition that’s on for the rest of the school summer holidays – until the 14th of August. 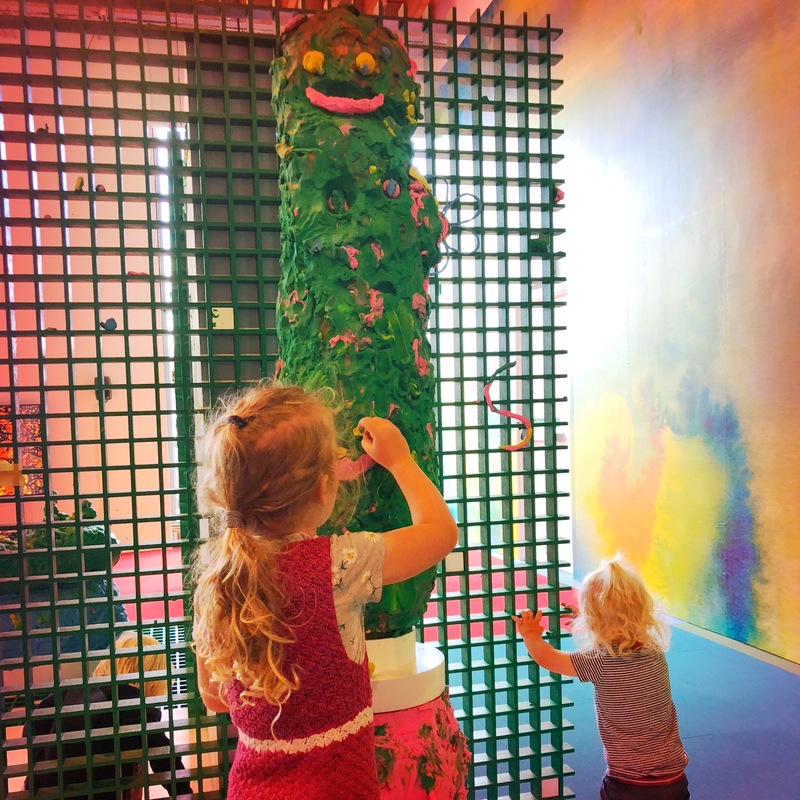 It’s basically a room filled with fully interactive art exhibits for kids to play with and mould and touch and wear. 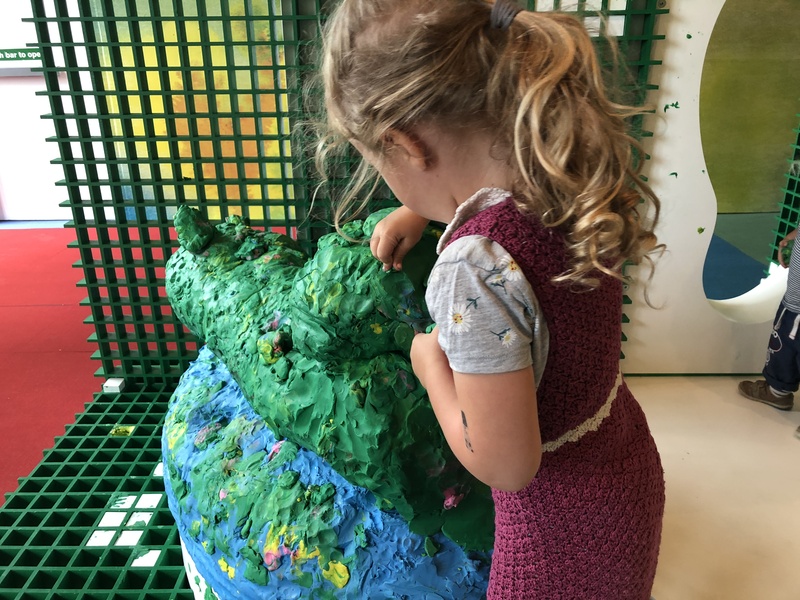 There are big plasticine sculptures that kids can mould and add bits to and take bits off and really do whatever they want with. Both of mine had a great time playing with these. The little man mainly took bits of plasticine off the sculptures and ran around the room shouting “ball” and throwing it or trying to squeeze it into small spaces. But the little lady was making cakes and flowers and putting faces on the sculptures. The pair of them played with the plasticine for ages. 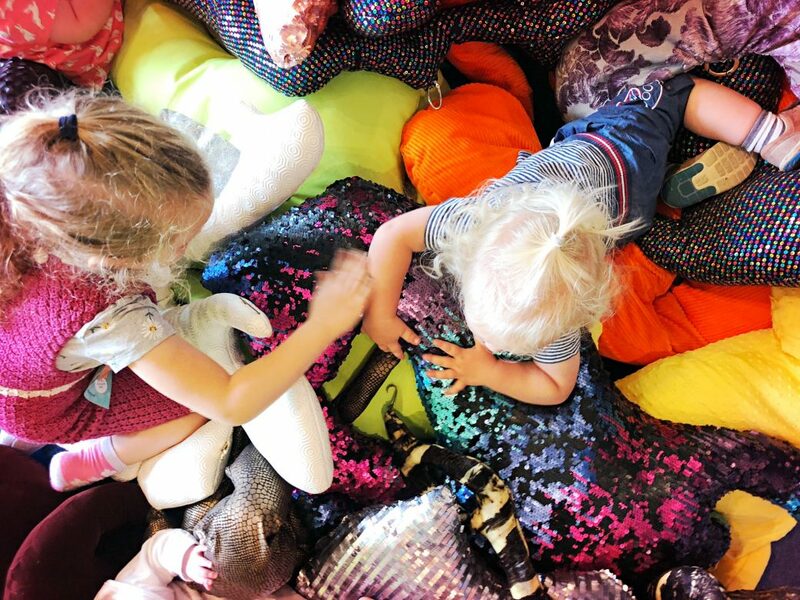 They loved playing in the big pile of weirdly shaped cushions too (I don’t know what else to call them – they’re the things hanging on the walls in the photo below). Some of them have fake hair attached to them (totally freaked me out when I touched it without it realising there wasn’t a human attached to the other end of it) and there are all sorts of shapes and materials and textures. They are supposed to be wearable but the kids were making them into animal shapes on the floor. The little lady was fascinated by the sequins and spent a good 15 minutes trying to make the sequins on one of them all the same colour. They also quite liked taking a running jump at the pile of them on the floor. Can’t blame them really; it was a good big squishy soft pile. There are also a few screens that are interactive: one reacts to touch, one to movement and one to noise. At the noise one; if you make enough noise it makes bubbles come out a bubble machine overhead. This was the little man’s favourite. 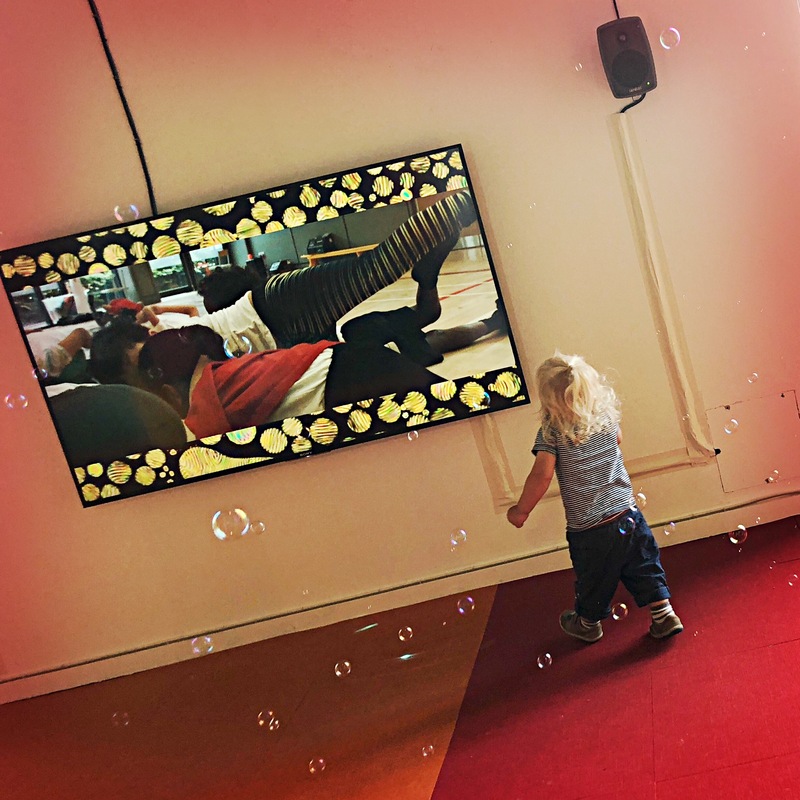 He absolutely loved running through those bubbles! 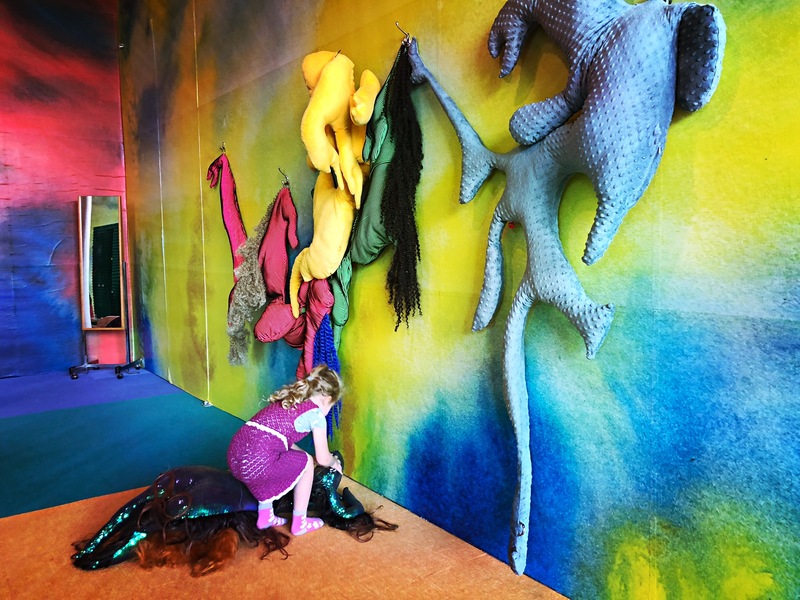 The Children’s Exhibition at Tramway is free to visit. The Children’s Exhibition at Tramway is open 12-5 Tuesday to Friday and 12-6 at weekends. It’s closed on a Monday.